Fig. 1 from page 1 of the brief: Soil erosion is triggered by climate change impacts, endangering vegetation and ields in the valleys. Morocco’s geographical position provides it with an exceptional range of very diverse bioclimates and hence a great diversity of ecosystems, species and genetic resources. These are important for the livelihoods of rural communities and the country’s economic development. However, many ecosystem services are being over-utilised or degraded, and their potential for use is increasingly threatened by the impacts of climate change. The Government of Morocco is making extensive political and strategic efforts to conserve these resources, particularly biodiversity, taking into account climate risks in the development of affected sectors, including agriculture, nature conservation and tourism. However, the responsible state institutions have thus far lacked the appropriate instruments for promoting the sustainable use of ecosystem services. The GIZ project ‘Adaptation to Climate Change/Implementation of the Nagoya Protocol (ACCN)’ was launched in 2013 to assist Morocco’s state institutions in creating environmental instruments for adaptation to the impacts of climate change. The lead executing agencies are the Ministry Delegate to the Ministry of Energy, Mines, Water and Environment responsible for the environment and the High Commission for Waters, Forests and Combating Desertification. This case study provides details about the project, which closed in June 2016. To consolidate the previous results of the ACCN project in the field of climate change adaptation, biodiversity and ecosystem services, a follow-up GIZ programme has been developed. This programme 'Environmental and climate governance in Morocco' is running from January 2016 to December 2018, and is commissioned by German Federal Ministry for Economic Cooperation and Development (BMZ) and lead by the Ministère délégué chargé de l´Environnement (MdEnv) in Morocco. Read about other examples of climate change adaptation in the Middle East and North Africa (MENA) region in Bartels, M. & Prinz, D. (Eds.) (2016) 'Coping with Water Scarcity under Changing Climatic Conditions: Best Practices and Innovations on Trial', available here. development of a legal and institutional framework for the access and benefit-sharing mechanism (Nagoya Protocol) and consideration of ecosystem services and climate change adaptation in national strategies and programmes. Across all three areas of action, the programme placed a particular focus on promoting cross-sectoral coordination and cooperation. It concentrated its efforts on the southern region of Souss-Massa (Agadir) as well as Beni Mellal-Khénifra in the Middle Atlas. The programme efforts complemented other German and multilateral development cooperation activities. As part of the project, a capacity development programme for incorporating ecosystem services and climate change adaptation into regional and municipal development plans and was developed and implemented. Those involved in the Regional Observatories for Environment and Sustainable Development (OREDD) from the regional authorities and municipalities in the pilot regions received support to strengthen their roles and responsibilities related to climate change adaptation. Sustainability standards were developed for local ecotourism in the Souss-Massa pilot region, particularly for protected areas as well as the argan forest and its products. The basic groundwork for certification was created among Moroccan ecotourism providers. The programme and follow-up are helping to improve regional environmental governance. A monitoring system for climate change adaptation was established for the OREDD in the pilot regions. In cooperation with the stakeholders and all regional actors, the programme developed and agreed upon indicators for climate change adaptation and biodiversity management. The programme laid down obligations regarding roles and responsibilities for the collection and provision of climate and biodiversity data. The Observatoire National de l’Environnement et du Développement Durable (National Observatory for the Environment and Sustainable Development) decided to apply this innovation across all of Morocco’s 16 regions (wilayas), integrate the collected data into the Regional Environmental Information System (SIRE) and incorporate this into municipal planning processes. Along with its Moroccan partners from the academic and private sectors, the programme began developing the legal and institutional framework for access and benefit-sharing (ABS). An initial draft of the legislation for implementing the Nagoya Protocol in Morocco was drawn up and made available for first reading. In addition, a development partnership was agreed upon with a European cosmetics company on the use of Morocco’s biological resources and their exploitation for cosmetics in accordance with the ABS certification mechanism. A cofinancing agreement was concluded with Morocco’s highway authority (Société Nationale des Autoroute du Maroc), the National Institute for Agricultural Research (INRA) and the Dresden-based engineering company IPROconsult. Climate change adaptation measures (erosion protection) should be implemented along stretches of highway that are threatened by heavy rainfall and erosion. Achieving goals such as protecting the environment, preserving biodiversity or adapting to climate change requires much more than just appealing to decision makers or the public. The GIZ ACCN project shows the way. It includes (a) the development of the legal and institutional framework in support of the Moroccan Government; (b) awareness raising; (c) incorporation of ecosystem services and climate change adaptation into regional and municipal development plans; (d) improved environmental monitoring; (e) assistance in making use of Morocco’s biological resources; and many other aspects. This holistic approach is the basis for the success of the project. 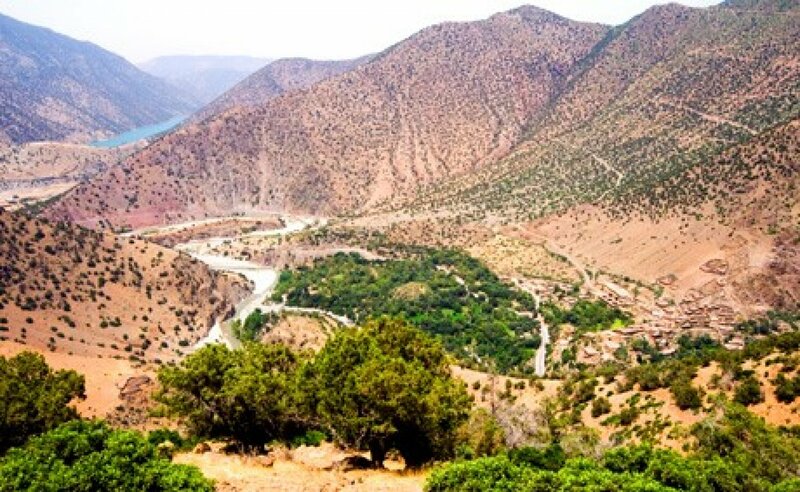 Upscaling: Until now the project is concentrating its efforts on the southern region of Souss-Massa-Drâa and Tadla Azilal in the Middle Atlas. A next step could be expanding to all wilayas of the country. Transferability: Cooperation between the representatives of a more conservative society and staff members of an internationally operating agency is never without friction, but it seems to be feasible, and, as this example shows, is for the best of society and the environment. The concept has a wide scope, including creating legal frameworks, helping to improve regional environmental governance, collecting data, developing partnerships (e.g. with a cosmetics company) and protecting the highway as climate change adaptation measures. It is a convincing concept based on a trusting partnership that is well adaptable to the conditions in other countries. This project seems to be a suitable case study for political decision-makers in other Arab countries for how to achieve legal and practical protection for natural resources and the fair use of environmental services. Fig. 3 from page 2 of the brief: An argan tree in the Souss-Massa region. Bartels, M. & Prinz, D. (Eds.) (2016). Coping with Water Scarcity under Changing Climatic Conditions. This document is part of the publication Bartels, M. & Prinz, D. (Eds.) (2016).